Boskalis’ revenue in its offshore energy segment — which includes construction and services in offshore wind, oil and gas, and pipelines and cables — fell 4.2% year-on-year to €475.7 million. Meanwhile, the Dutch firm's €49 million in earnings before interest, tax, depreciation and amortisation (Ebitda) between 1 January and 30 June was less than half of the €105.3 million in the first half of 2017. Low-end marine transport and services and subsea services showed the largest decline in earnings, while cable-laying — including for offshore wind farms — made a positive contribution to the result, the company stated. In the first half of the year, Boskalis carried out cable-related projects at the 93.2MW Aberdeen Bay, 385MW Arkona, 497MW Hohe See and 406MW Horns Rev 3 projects — all of which contributed to the offshore energy segment’s revenue, Boskalis stated. The offshore energy segment’s order book was also lower than it was one year earlier, although it excluded major contracts on which it is yet to achieve financial close. Its order book stood at €862.3 million at the end of June 2018 — 7.2% lower than at the end of June 2017 and 14.7% lower than at the end of December 2017. However, this figure does not include cabling contracts for the Triton Knoll and Moray East wind farms. It expects financial close on these contracts, which it stated are worth more than €150 million combined, in the second half of the year. Overall, the division made an operating loss of €7.2 million in the first half of the year. In the first six months of 2017, it made €36 million profit. The company described the offshore energy segment’s outlook for the remainder of the year as "reasonable", and added that "large contracting projects in the order book are expected to make a good contribution to the result". 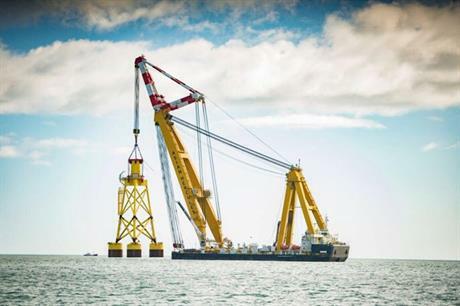 The outlook for the ongoing cable-laying projects in offshore wind is also "favourable", Boskalis stated. The marine contractors consolidated its services portfolio for the offshore energy segment under the name Boskalis in April.